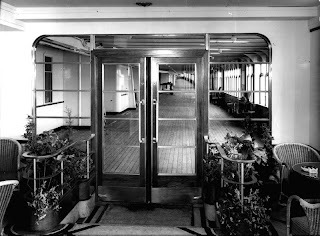 Six members of a congressional committee sailing to Europe last August were nearly scared out of their wits while on the Queen Mary. Headed by Rep. Louis Rabaut of Michigan, a subcommittee of the house appropriations committee had debated whether to fly or to go by boat. Finally they decided to sail--but they wished they hadn't. The group which decided to enjoy some relaxation on steamer chairs included Dean Gillespie of Colorado, Robert Jones of Ohio, Butler Hare of South Carolina, Thomas O'Brien of Illinois and Judge John Kerr of North Carolina. Kerr had argued for the boat trip and finally convinced his colleagues. The congressmen were just beginning to relax on their first night out from New York when an army officer came to Chairman Rabaut with a disturbing message. "The skipper thought you gentlemen out to know," he said, "that we have just received a code message from the FBI. They report they have discovered there are a number of incendiary bombs on the boat scheduled to go off at midnight. "There are several companies of Japanese-American troops on board," the officer told Rabaut, "and Japan is still at war with the United States." Rabaut called his colleagues together and told them the news. Judge Kerr's first comment was: "I wonder if the skipper has ordered airplanes to hover around the ship." All were alerted the entire night while the ship's crew searched unsuccessfully for the bombs. No trace of them was ever found, but the restful relaxation the congressmen had hoped for was not achieved until they set foot on solid ground once again.